The Virgin Money London Marathon 2018 – on Sunday 22 April – saw four dedicated runners take to the streets of London to run the 26.2 miles of the world’s best marathon and raise over £17,500 for Get A-Head. It was a fantastic day, in fact it turns out it was the hottest London Marathon ever and the crowds of supporters were out in force – the London Marathon truly has an unbeatable atmosphere! Thank you so much to John Dickinson, Michael Gloster, Rob Alderson & Lee Constable for choosing to run the London Marathon 2018 and support Get A-Head and thank you to their friends and families for sponsoring them. Please do share your pictures and stories with us! 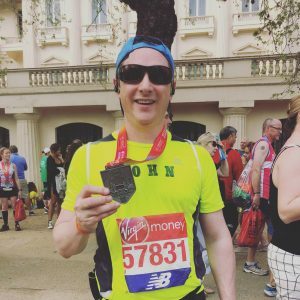 Michael Gloster, is a friend of our Chair of Trustees, Tom Bromwich, and decided to run the London Marathon for the first (and very probably last) time!! 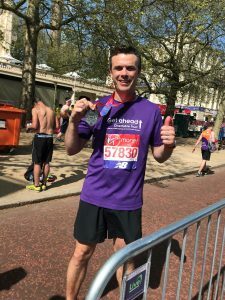 Michael wanted to help us raise awareness of Get A-Head as well as raise lots of funds to support our work, he finished the marathon in 4hr 33mins. Michael said ; “Wow, the whole experience was fantastic but much tougher and more painful than I was expecting! Despite all the training, which admittedly took a bit of a hit towards the end due to snow, work commitments, a chaotic house move and perhaps a bit of complacency on my part, my legs just weren’t up to the 26.2 mile challenge in such warm conditions. I probably set off a bit too fast and should have adjusted my pace to the conditions sooner. As the 3:30 and then 3:45 pacemakers disappeared into the distance my focus turned to just surviving and making it to the finish line in one piece. By the halfway stage most of the muscles in my legs started cramping up and I had to really slow down in order to keep moving. The crowds of people lining the street were absolutely amazing and helped keep me going with their encouraging cheers, plenty of “high fives” and a range of sweets, oranges, bananas and ice lollies. The regular water, energy drink and shower stations were a big help too.